Is Maître Parfumeur et Gantier depressed? Lazy? Complacent? Thinking about “retirement?” If not, why hasn’t the (badly designed) brand's website been updated in years; Cuir Fétiche (2011) isn't on the site, nor is Bois de Turquie, released in 2008! And what about the ugly bottles people have been making fun of for ages? Keep the bottles if you must, Maître Parfumeur et Gantier, but at least nix the cheap plastic “jewels” (that often fall off) from the caps. Still…I always try new Maître Parfumeur et Gantier fragrances. Maître Parfumeur et Gantier’s latest perfume, Ambre Doré, opens with the aromas of vibrant oud, saffron-scented leather and “green” (geranium?) styrax. Ambre Doré’s “character” is tougher than most amber perfumes, which is fine by me (I like my ambers rough and ‘scratchy’…if they’re too smooth and sleek I’m bored). As Ambre Doré’s opening burns off there’s a musky barnyard moment or two (we’re talking a dry-manure-in-the-distance aroma) followed by the scent of bananas steeped in turpentine. In Ambre Doré’s base, residual oud mixes with the more classic amber components: sandalwood, myrrh and vanillic elements (nothing too sweet); the oud dominates the amber, just, but oud and amber are in excellent imbalance, providing a welcome tweak that prevents an amber-as-usual fragrance. My relationship with amber perfumes is complicated. I’m not a fan of powdery, sweet, patchouli-and-vanilla-stuffed ambers. Heavy, “upholstered” amber perfumes leave me feeling either over-groomed and fussy or rumpled and sloppy...depending on the mix of ingredients. I like ambers that make me feel “alert” and “crisp.” I only keep one bottle of amber perfume around and I'm in the market for a brand-new amber fragrance for autumn; Ambre Doré is a contender for that open slot. Maître Parfumeur et Gantier Ambre Doré Eau de Toilette is available in 100 ml (around $130). For buying information, see the listing for Maître Parfumeur et Gantier under Perfume Houses (although as of this writing, it is not yet in widespread distribution; in the US it can be found at MiN New York and Parfum1; in London at Les Senteurs). Listed notes: geranium, clary sage, coriander, saffron, styrax, sandalwood, myrrh, vetiver, oud, amber. 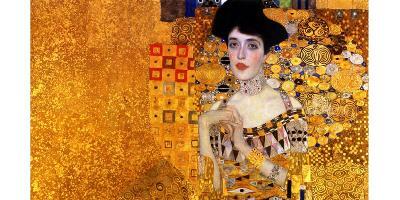 Note: top image is Portrait of Adele Bloch-Bauer by Gustav Klimt [cropped] via Wikimedia Commons. THis sounds very nice, I’m like you and like an amber w/ some stink behind it. I visited Maitre Parfumeur several years ago w/ a friend, (our “perfume tour of Paris”) and they were very helpful and spent lots of time with us and their perfumes. I bought Fleur d’ Iris to remind me of Paris in the spring. And yes, for the price, the stupid jewels are very cheesy! Kelly: the three bottles I’ve bought over the years had the jewels fall off or ‘slide’ off center. Ha! Oh so did mine. I re-glued it, just so I didn’t have to look at old glue residue gunk. LOL But I remember thinking for the price I shouldn’t be repairing their bottle. Bananas soaked in turpentine? Oh God. Dampier: smells GOOD…and doesn’t last long. Ha! I thought the same thing. And even though Kevin says it smells good and doesn’t last that long, I think I’ll pass on this for now. Dont they already have Ambre Precieux? How different are the two? True! I forgot about that and yet I love that one. If this is a little rougher, more dissonant amber entry from the brand, they’ll have a nice spectrum covered. This sounds great! I always forget about this brand. Thanks, Kevin. I’d like to try this (really, how can one pass up bananas soaked in turpentine!). On the other hand, I bought Nobile 1942 Ambra Nobile last year and probably don’t need another. Have you tried that one? Noz: no, I haven’t but I’ll add it to the list. Nice review. I’m going to sniff my decant again with it in mind because pretty much all I get is AMBER and not enough oud etc. Goodness the bottles are DREADFUL! Dona: pour it on! No dabs! Hi Kevin, I was just reading your take on Goutal’s Amber Fetiche yesterday! Did that one ever replace your beloved Sultan? Amber Precieux, as mentioned above, seems to be a massively popular amber scent – at least among perfumistas – so it will be interesting to see how this one fares. Merlin: Fetiche is on the list…who will win? Thankfully i have many months to decide…. 1. Disregard for on-line presence or 2. Discontinued batch of Soir D’Orient?